Story with it is that I started animal farming in early a16, and I had lots of alpacas. I didn't build enough yard space and restrict their movement at first, so they found their spaces where they wanted to. this guy is alive as you can see and went to sleep in my temporary meat freezer. Guess it wanted some comfort. http://steamcommunity.com/sharedfiles/filedetails/?id=822797254 - Hi, im Trumpet and welcome to jackass! shallow but still funny ..
Max resolution is 1440x900. Damn old laptop lagging on zoomed out screen! If I would go to vacation in off-Earth, even fictional place, I'd choose Nibel. Oh god, someone actually have monitores like that. A picture of my town besieged by 70 mechanoïds. Version 0.18.1722, no mods. 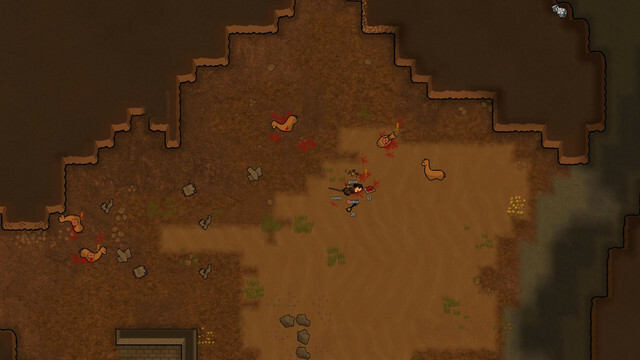 Lost Tribe, Cassandra, rough difficulty, permadeath, tropical swamp, year 8. 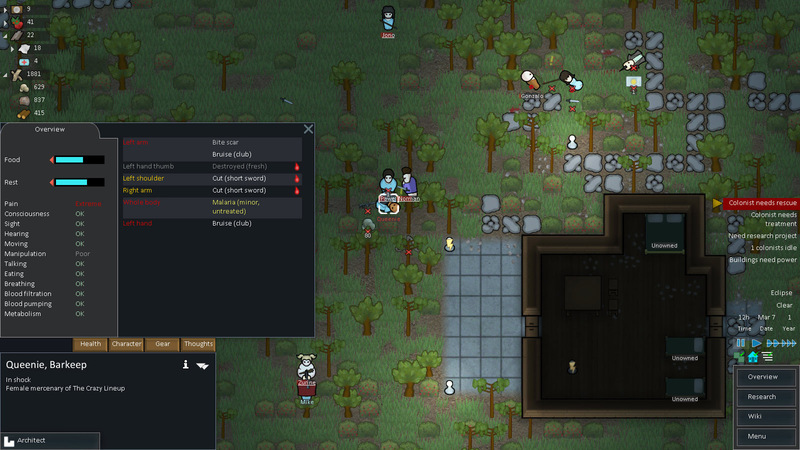 Hunting with Grenade Launcher = not the best of ideas. 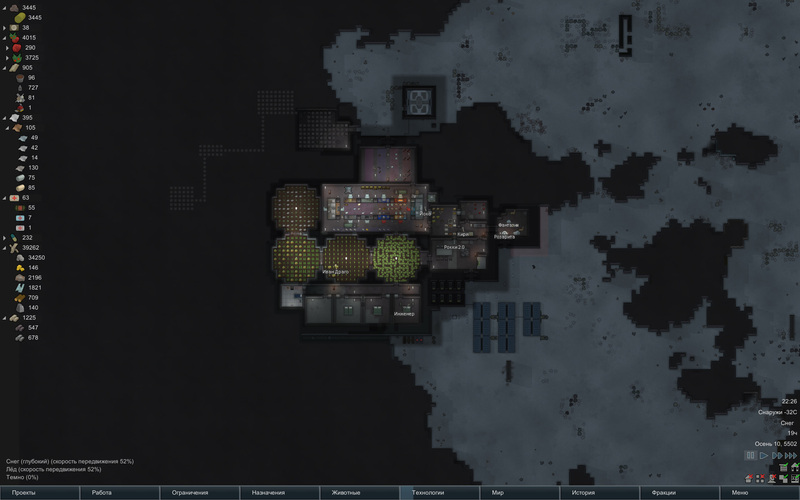 Here, my old colony on A16. I was using EPOE and CR, you know why, and also edited Titled Soil, so everything on titled soil was growing not with 200% grow speed factor, but 110-120%. Ryan Stiller (Инженер/Engineer), one of my best colonists. Engineer/Builder. Survived. Yoko (i forgot full name) (Йоко/Yoko), scientist, and also doctor. Got brain injury, but it was already end of the second year, so i was able to make AI chip. Kiri, or Kirihara (Кири/Kiri), chief. Was cooking meal(s), like, every 3-6 RW hours. Ivan (Иван Драго/Ivan Drago), melee fighter, was named that because he wrecked entire hive (everyone was injured, except him, and it was first year), with injuries, but still. Rocky (Рокки 2.0 /Rocky 2.0), not melee fighter, but she was able to beat some raiders to death using bare hands (no ammo left). Was named before that accident with raiders Europe, because for some reason i thought Luxemburg located in Europe (I think it was midnight).